I fell hard for it in 1998 on my first trip to Los Angeles. My stepdad took us to a Thai restaurant (another first) and I don’t remember what I ordered, but I do remember it tasted exactly like heaven. Years later, still in love with Thai food, I became a cook in a restaurant that used South East Asian ingredients. I’m not an expert in Thai ingredients, but I have encountered quite a few of them. I’m all for being adventurous, but knowing a little bit about what you’re getting into can reduce stress. Plus it’s nice to know if you’re supposed to actually eat an ingredient or if it’s just for flavor like a bay leaf. So if you’re in Thailand, or just at a Thai restaurant, here are 5 ingredients you might find on your plate and how to approach them. These are the fresh version of black pepper, and they look a little like capers. 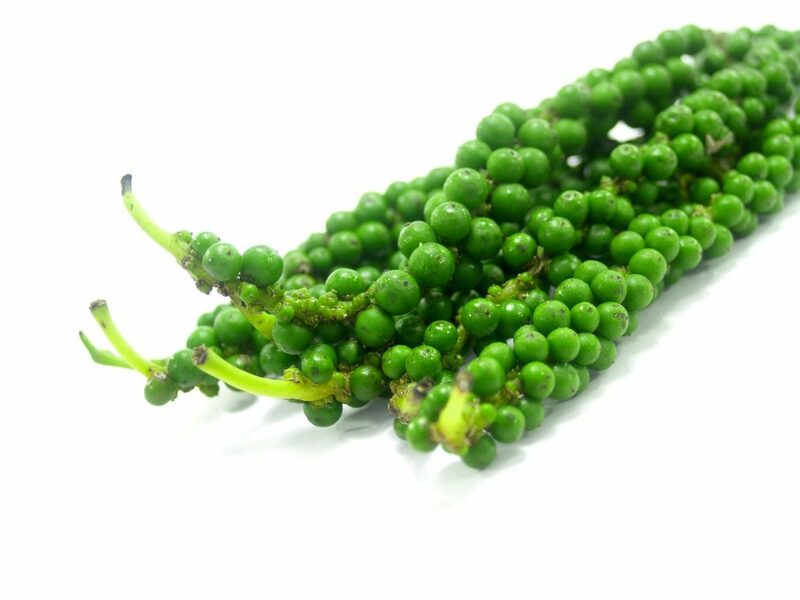 You might find green peppercorns in a bunch like tiny green grapes or swimming around individually in your food. Yes, unlike dried black peppercorns, you can actually eat fresh or brined green peppercorns whole. I probably wouldn’t eat the stem if they’re still in a bunch, though apparently that is an option. Fortunately they don’t have a lingering heat like spicy peppers, but they have the potential to send steam from your ears if you eat a lot of them. To ease into their flavor, scrape the individual peppercorns off of the bunch with your spoon and try one or two with a bite of food. They’re especially nice for cutting through the richness of drunken noodles and pork dishes. You don’t have to eat them to enjoy their flavor. Some of their peppery pungency will already be infused into your food. You can see a cube or two of blood tofu in a dish of green curry from Kao Soi Nimman, Chiang Mai, Thailand. This Thai ingredient looks like cubes of liver but the texture more closely resembles actual tofu. Blood tofu is chicken blood, congealed into blocks, then sliced into cubes for dishes like curries and khao man gai (steamed chicken with rice). You can, and according to Tony it might even give you a little extra pep when doing a workout. My guess is that’s from an extra boost of iron, or maybe he’s acquiring some mystical chicken power. Think of blood tofu like an incredibly mild organ meat. Our favorite place to eat Thai green curry in Chiang Mai is Kao Soi Nimman, and they use blood tofu as an ingredient in that dish. There are plenty of places that make green curry without it though if you’re not into becoming powerful like a chicken. These little eggplant look like giant peas, or like tiny unwrapped tomatillos. 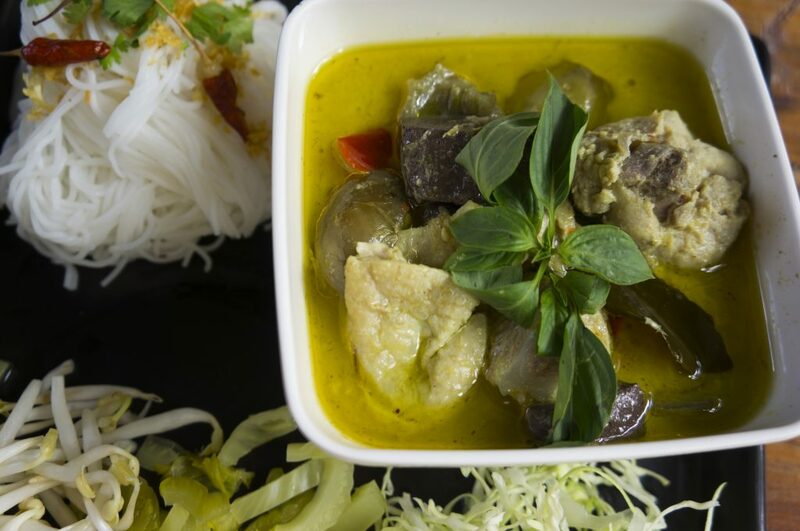 They have a slightly bitter flavor and add an interesting dimension to salty-sweet dishes like green curry. Yep. Eat the whole thing. When you bite down a flavor bomb will burst in your mouth. The only reason not to eat them that I can think of is if you have some bias against nightshades. If you found a tough leaf in your food, it’s not lawn debris or even a bay leaf. It’s probably a kafir lime leaf. This aromatic Thai ingredient imparts a fresh citrus flavor without the tartness of lime fruit. 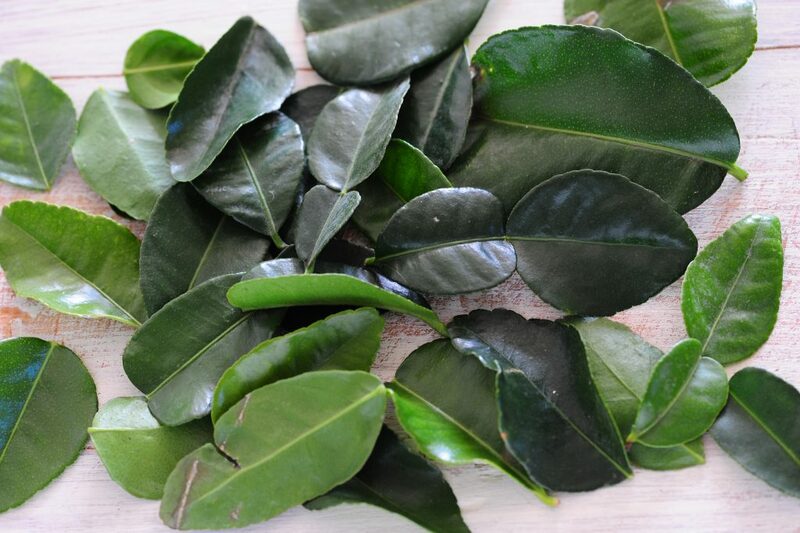 Like bay leaves, kafir lime leaves aren’t supposed to be eaten. They won’t hurt you if you do eat one. They’re just kind of tough and bitter. 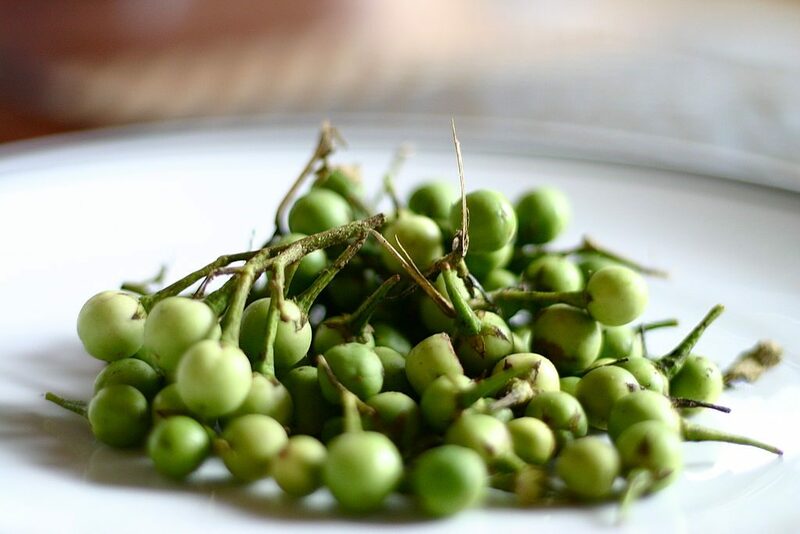 The limey flavor will already be infused in your curry or soup, so you won’t be missing out by pushing this Thai ingredient aside. 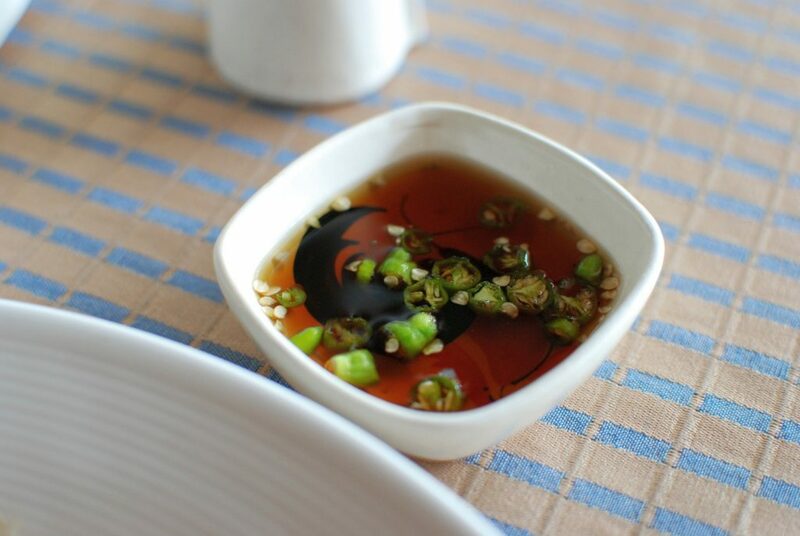 Phrik nam pla is a combination of fish sauce, fresh chilies, and lime juice. It’s served as a condiment in little dishes, in a bottle on the table, or in little packets in Thai takeout. It has a salty-tangy-spicy-umami flavor. Instead of umami, you could think fermented/funky and still be in the right ballpark. The funk comes from the Thai ingredient fish sauce, which is made by fermenting tiny fish or crustaceans. Lots of Thai dishes are made with fish sauce, so you might already be eating it without knowing. You can eat phrik nam pla unless you’re allergic to fish or shellfish. Some folks love fish sauce, some don’t. I’m in the love it camp. If you’re not into fermented flavors this probably won’t be for you, but if you like things like kimchi try a splash of phrik nam pla on fried rice, noodles, grilled meats, or anything else that could use a little salt. It’s especially nice when your food tastes bland or monotonously sweet. What Thai Ingredients Do You Wonder About? Ever tasted a Thai ingredient you couldn’t quite place? Have you seen an ingredient you were afraid to try? Or maybe you just weren’t sure how to eat your Thai food. Tell me about it! If I can’t solve the mystery, I know a few people who probably can.